If you want to know about color and how to use it in your art, I have an incredible book for you to work through: Color: A Workshop Approach, by David Hornung. When I revised the color theory curriculum for the graphic communications students I taught at Waukesha County Technical College here in the southeast corner of Wisconsin, I incorporated many of the ideas I learned from David Hornung. I was never able to take one of his courses, but found his book one of the most enlightening practical art texts I have ever experienced. Really, I mean it. It’s not only that he explains color in a way that you can understand it, the exercises bring the theoretical ideas to life. I know. I saw it happen with my students. In every class that I explained a concept, in a way that I imagined David Hornung would, and in every exercise, painted diligently with gouache (not a favorite for the computer-based design students I taught), bells rang, whistles blew, and eyes opened wide with new, a-ha! understanding. I see that he also wrote Color: A Workshop for Artists and Designers, which, from what I can see, incorporates many of the same ideas. I just ordered it from Amazon. Here’s his website, in case you’re interested. And so, whenever I read a new explanation of color theory, like the scant paragraph Beckah Krahula offers us on Day 22 of One Zentangle A Day, I have not only David Hornung, but piles of research and student experience to measure it by. And I say: BLAAAHHHH. And Aaargh. Sorry Beckah, this chapter, about warm and cool color wheels, really falls short. If anything, it will confuse any novice to color, and certainly won’t foster a love of practicing warm and cool, or dull and bright, or dark and light color applications. And I don’t know what “boxed sets” you are referring to, but they don’t all include a warm and a cool selection for each of the primary colors. And your color wheel diagram doesn’t really show the difference, either. I am going to suspend further judgment until I read more. Maybe this was just a brief introduction, not intended to be in-depth (though any discussion of color requires some depth, in my humble opinion). 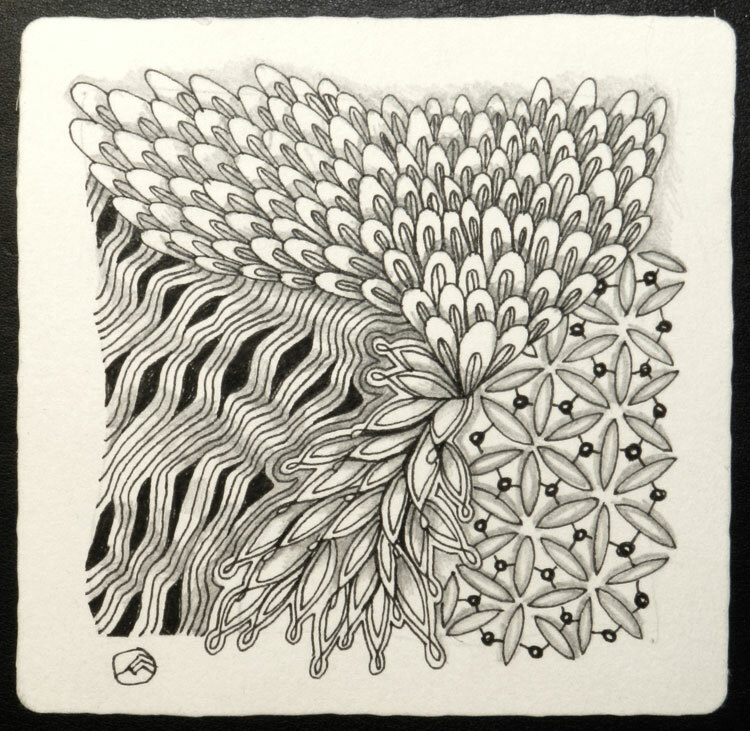 And, the assignment is to learn two new tangles and use them… without color. So here is mine. It’s also kind of a “blaah” tile… maybe a reflection of what I read in the chapter? Tangles: tagh, tat, quandary, and diva dance.